The Poland Falun Dafa Cultivation Experience Sharing Conference was held on October 18, 2009 in Warsaw. 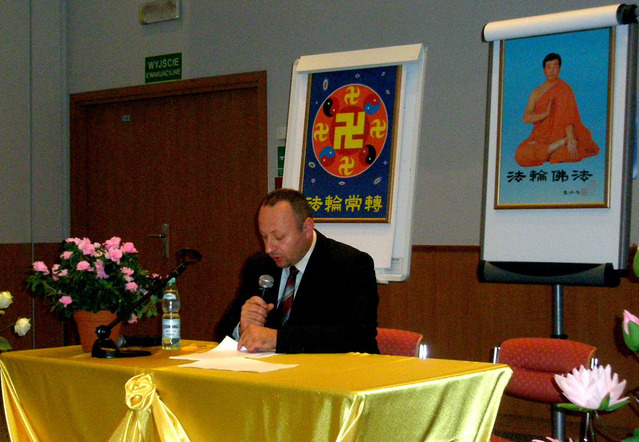 It was the fifth time that a Fa conference was held in Poland. Seventeen practitioners presented experience-sharing papers. Practitioners at the Fa conference said that they cherished the opportunity to attend. When reporting to revered Master, they shared their different understandings of the Fa at different levels. 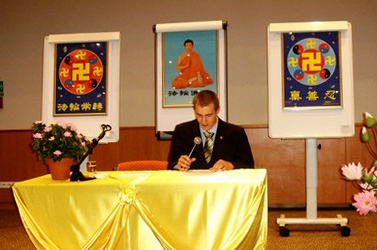 Several told of their tremendous changes both, physical and mental, after taking up Falun Gong. They also deeply felt the preciousness of Master's compassionate and arduous salvation. They realised that only by maintaining righteous thoughts and actions, striving forward diligently and cultivating solidly, doing well the three things, and offering salvation to all predestined people can they be Fa-rectification Dafa disciples. A Western practitioner shared how he made copies of leaflets and went door-to-door collecting signatures to support an end to the persecution. Another practitioner talked about how he improved his xinxing (heart/mind nature) and cooperated with practitioners as a whole while hosting and promoting the Shen Yun Performing Arts performance. Another practitioner shared how he caught up with the progress of Fa-rectification. 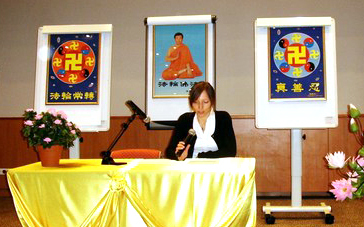 The day before the Fa conference, practitioners from different parts of Poland held activities at the GD Trade Centre in the suburbs of Warsaw and Old City to introduce Falun Gong and inform people about the persecution. At 5:00 p.m. they gathered at the front gate of the Chinese Embassy in Warsaw to protest, calling for an end to the persecution of Falun Gong.